Director/Writer: Jef Richard / Cast: Joseph Alan Johnson, Greg Dawson, Valerie Sheldon, Rodney Montague, Shannon Engemann, Beth Toussaint, John Goff, George ‘Buck’ Flower. 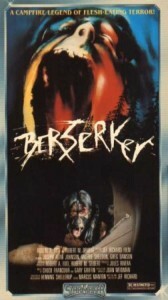 According to the stock-nerd character, a Berserker is some kind of Viking dude who has a bear mask, eats human flesh and has coincidentally been reincarnated in a descendant to “terrify” a group of “teenagers” who go on a camping trip where an elderly couple were shredded at the start. So far, so The Prey. But somehow even less engaging. Who is the ancestor likely going to be? Mike, Josh, Kathy, Larry or Pappy Nyquist? I’m going for Josh. Berserker barely qualifies as a slasher film at all, with a dismal body count and only two of the “teenagers” actually dying – both female, while the complete and utter dickhead guy is spared, as is the nerd, the cry-baby jock and a girl who does or says next to nothing. Good opportunities to create tension slip right through writer-director Richard’s fingers and the lack of any strong, central heroine loses marks also. 79 minutes never felt so long. Blurbs-of-interest: Flower turns up here and there in Cheerleader Camp, The Gas Station and Sorority Babes in the Slimeball Bowl-a-Rama; Joseph Alan Johnson was not only in the original Slumber Party Massacre but also wrote and starred in Iced! But the true before-they-were-famous star here is Beth Toussaint – and she gets naked!! She supplied the voice of the female caller in Scream 3 and has appeared in numerous soaps and TV shows. tagged with before they were famous, hair don'ts, I want to die, Nu-di-ty, obvious identity of killer, slasher, the 80s, what the hell! ?, who finances this crap!? I really don’t understand why, but I sorta like this one! No, I can’t explain any further. awful bodycount. awful pacing. why, oh Lord? why?